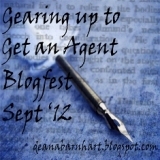 Joining GUTGAA‘s Blogfest party a bit late… but excited to be here! Amazing lineup Deana has put together, don’t you think? I’ve had luck publishing my literary essays and a couple how-to pieces, but the search for an agent for my fiction continues. Before momhood and work-from-home freelance editing, I was a high school teacher of literature, writing, and Gifted. I’ve tried YA, historical, picture books, and women’s fiction, but I’ve found the most fulfillment (and had the most requests) with an upper MG adventure with fantasy elements I’m currently querying. Look to the left, what do you see? The kitchen timer, which I brought to my desk on Saturday so I wouldn’t miss Pitch Madness on Brenda Drake’s site. Haven’t taken it back to the kitchen yet. Probably will leave it here til Friday at 11 a.m.! Drink of choice while writing? Starbucks French Roast from the Keurig early….Green tea mid-day….And a bit of Shiraz after the kids are in bed. Complete silence or music? Silence preferred, but can usually work with a modicum of background household activity. Latest inspiration? My new WIP (started last night, in honor of both kids heading off to school today!) is a MG historical with threads of magical realism. I caught an ad for an upcoming documentary on PBS and the whole idea just entered stage right. Thanks to Deana and all her volunteers for a great opportunity, and good luck to all! 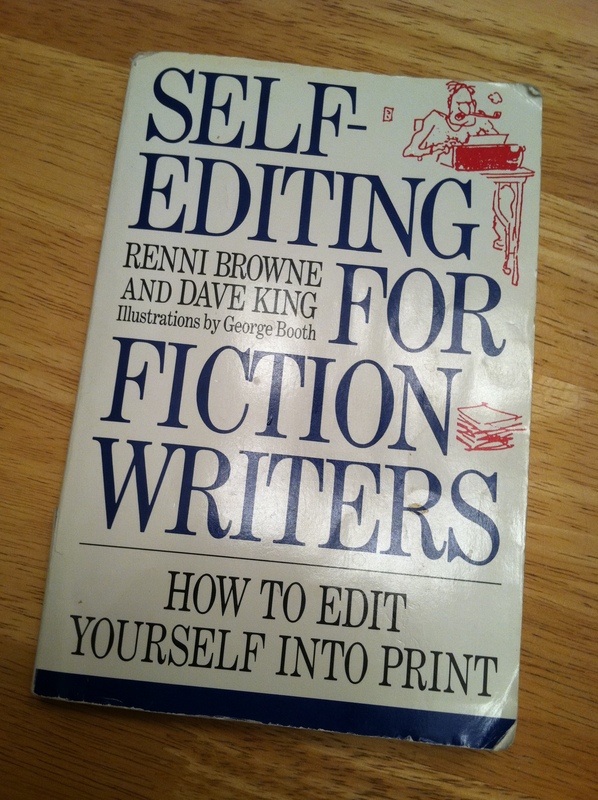 Every time I pick up Self-Editing for Fiction Writers: How to Edit Yourself into Print by Renni Browne and Dave King, it’s like drinking a hot tea with honey when you have a scratchy throat. Soothing and helpful. There’s no snarkiness here, just wisdom and common sense advice told in a clear and friendly tone. There are even little cartoons by George Booth to keep you smiling as you slash and burn pieces of your manuscript. My copy is literally yellow with age and use. Assigned reading in the early semesters of my fiction writing program ten years ago, this one stays within reach on my desk, with dogeared and paper-clipped sections for quick reference. Loaded with examples, the authors never talk down to the writer or say anything discouraging, and they keep quiet on the slim chances we all have of fiction publication. Consequently, the soothing part is just being allowed to go in to your work and revise the heck out of it, based on their recommendations. There’s a tighter focus on what to do and how to do it because they leave reality checks and opinions to the Noah Lukemans of writing guides and inspiring words and tones to the Anne Lamotts. Just last night, flipping through the guide for some tidbits to mention in this post, I reviewed the chapter “Easy Beats” and realized I better edit (again) the dialogue in the second half of my novel to get rid of the extraneous beats. I’m forever having characters sigh or nod their heads or take off or put on their glasses, because I don’t want them just standing there awkwardly; but Self-Editing says no, let the dialogue “crackle” with its own tension, keep the beats to a minimum, don’t slow the pace too much. And I trust this book, so it’s back I go with the delete key at the ready. Oh, and if you don’t know the term “beat,” don’t even worry. Not only do the authors explain every term at the beginnings of chapters, they do it in such a painless way that you never feel amateurish or inexperienced. Beats are the physical activities character pursue as they talk and move in a scene, you read. Ohhh, yeah, your writer head thinks. I have those. And if you have too many, like me, you read the rest of the chapter for pointers on making beats more worth their while, and then you go revise. Other chapters detail breaking up dialogue and interior monologue for better pacing, editing out repetition, resisting the urge to explain every little thing, and one of my favorites, making your writing more sophisticated. This has to do with eliminating the overuse of exclamation marks, italics for emphasis, and -ly adverbs, as well as keeping a tight leash on metaphors when the action or reveals need to take center stage (ooh, I need to be reminded of that last one a lot). The authors are flat out solving the mystery here on how to have a writing style, because once you rise to a higher level of sophistication in your writing, your voice can start to show. Voice is an elusive enough thing for writers. Thank goodness Self-Editing can help you clear away the obstructions in your voice’s path, and allow you a chance of honing it. One more note on the soothing effect of this guide: it’s one of the few I’ve seen that offers actual suggested answers to the end-of-chapter writing exercises. What a great way to douse any Inexperienced Writer Panic. Sip this book, and get back to work. But she did scorn a present that I sent her. A woman sometimes scorns what best contents her. On the surface, it appears that Valentine doesn’t think very highly of the ladies he courts, assuming that gifts like silent jewels will work much better to win them over than conversation. I think Shakespeare trusted his theatre-goers to see a deeper meaning, as he did so often; here, that women would not be moved to believe the banal talk of the unimaginative Valentine–that it would take more than his “quick,” predictable, dull words to inspire a brainy female. The fact that Valentine goes on to comment about how a woman sometimes seems to act opposite of the way she truly feels is added irony, since I bet the Elizabethan actor portraying him would have been coached to say the lines in a baffled sort of way. That’s all just fun Shakespeare commentary for a getting-towards-bedtime Sunday night. What I really wanted to do in this post was explain where my blog title comes from, and why I chose it. I like to call up allusions to Shakespeare in things I write, and titles are tricky enough things to do really well when you go it alone. This phrase, interpreting the scene the way I like to, sums up what I want this blog to be: more than just a bunch of random diary-type entries, more than just a line-up of my thoughts on the publication process or any personal frustrations about writing…more than just quick words. I’d like it to be a bit more, so that both the content of each post and the writing of the post itself helps me to remember why I get up at 5:30 a.m. to squeeze in some revision time, why I should send out another query, why I’m sitting here blogging even though it means missing the beginning of The Good Wife and putting off the pouring of a nice glass of Shiraz. Words–in all eras, even (maybe especially) in this one–are weighty things. They shouldn’t be dashed off and sent out without some thoughtfulness behind every one. They must be crafted, like fine linen or a sculpture, to inspire the reader. Take care, take care. So, I hope to craft more than quick words here, and maybe some of reviews and discussions of writing will even help a reader or two, just as the composing of them is helping me. 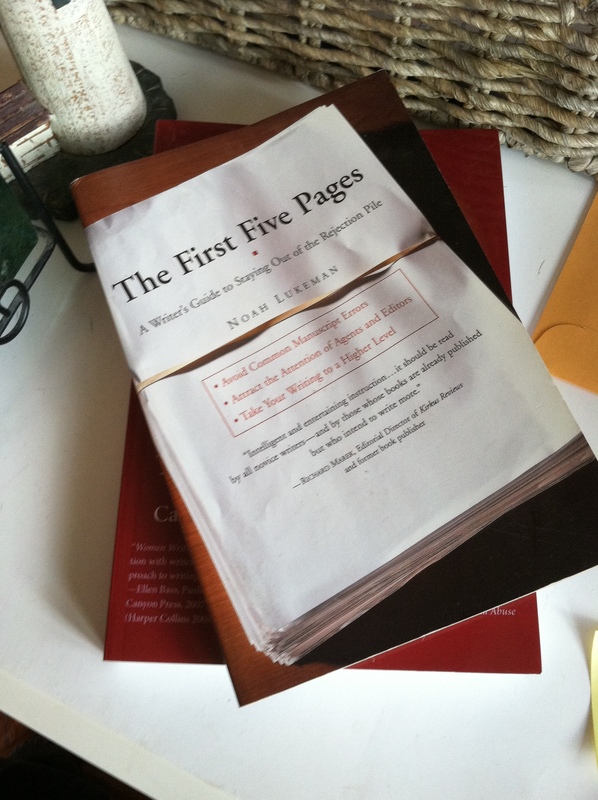 So here’s a writer’s guide that is not for the faint of heart (though of course writing itself and certainly attempting to get published are not for the faint of heart either): The First Five Pages: A Writer’s Guide to Staying Out of the Rejection Pile by Noah Lukeman. Unlike Anne Lamont, whose tone is funny if a little ironic and, at times, heartwrenching, this guy is like the astronomy professor in your 8 a.m. class for the science credit you and a bunch of other liberal arts majors had to get. He’s no fun. No matter how much you wanted to romanticize astronomy or referred to your lifelong fascination with it or tried to label it a fun subject, that professor would start in with his rate of declination equations and his calculable ascension angles and you’d just swim in how much not fun it was. This guy is like that guy. No matter how enthusiastically you tear into these pages or how nobly you remind yourself that you will forever hold tightly to your dream–nay, your quest for publication, Mr. Lukeman will take all the fun out of your pursuit. He’s the Debbie Downer of writer’s guides. Here’s the thing, though: I’d rather be left downtrodden and slightly mopish about my chances in the slush pile if it means I’ve gleaned some truth about the process, and I think the book gives valid and honest advice. You won’t get anywhere reading about the glory of writing for writing’s sake or how good it feels to tweak a tale just perfectly to your liking and damn all the rejectionists out there because you have a story in which you invested your heart and soul. There are those types of writer’s guides out there, but I won’t be profiling them here. No, I’ll stick with Mr. Lukeman and his oh-so-subtle arrogance, because he says what those inspirational “guides” won’t — that you shouldn’t write commonplace conversation in dialogue because it marks you as an amateur. That one too many adverbs or adjectives in the first couple paragraphs will get you form rejected. That the sole objective of an agent or editor upon beginning to read your query or pages is to find some grounds upon which to say, “Nope, not this one.” But here’s the thing; if you follow the advice in The First Five Pages, you stand a far better chance than the typical querier. Written in 2000, the book is a bit dated in its first two chapters on presentation–the discussion here refers mostly to the way your writing appears on paper, and he never gets into e-querying because that tsunami hadn’t quite yet hit the writing community. But the rest of the chapters present hard-core how-to advice and patiently reiterate the major flaws you as your work’s primary editor must hunt down and kill. If you don’t get the gist of each chapter in the text, he follows his topics with end-of-chapters examples and exercises that make what not to do blindingly clear–indeed, his examples are practically caricatures of bad writing. From the way he belabors show-don’t-tell, good dialogue tags, and avoiding info-dumping, I think Mr. Lukeman makes well known the auto-reject standards he upholds. From his tone, he has taught writers these same pointers over and over since he was a wee babe of an agent and editor. Reading it, you can almost hear his long-suffering sigh. 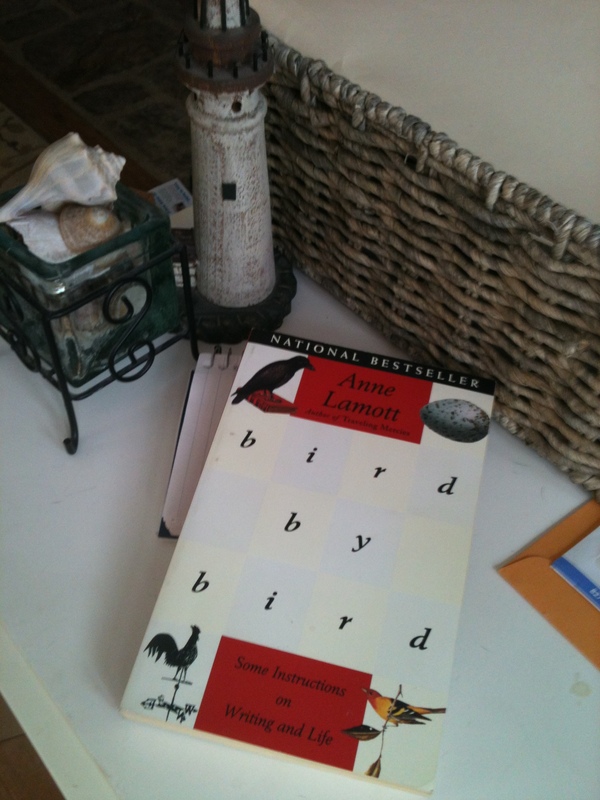 Anne Lamott’s Bird by Bird: Some Instructions on Writing and Life is probably my favorite book on writing, and I’ve read a pile of them. Lamott has a take-no-prisoners, hyper-realistic attitude on writing, so this book is not for the faint of heart; it oozes with proof that A) writing hurts and B) we, as writers, have to suffer a bit to arrive at anything artful on the page. This isn’t a new theme in discourse on the craft, but Lamott’s insights are fresh, practical, and graphic. Writing, she’ll have you know, is “about as easy and pleasurable as bathing a cat.” Pitching your book idea at a conference can feel like “you put your head in the lion’s mouth.” She describes the long, long hours you might sit at the computer without ever typing one good sentence, and the long, long pages you might compose to mine just one idea that has potential for revision. She suggests having a go-to pal who will read your draft and really critique it to pieces, comparing this reader to a man she used to know who would take friends’ animals to be put down when they just couldn’t do it themselves. But along with the pain and suffering of writers, another theme rises up in Bird by Bird: that writers are not helpless or hapless, and that we can tame writing into a corner… by beating it back with a stick, if we have to. The title is an immediate example; Lamott recalls her father’s advice to her brother when he once began writing a lengthy research paper on birds: “Just take it bird by bird.” Her advice has given me the edge over proverbial writer’s block many times: start with just one tiny thing, just whatever of your scene or character that you can see through a one-inch viewfinder. Start with that, and describe it. And know that the first draft can be bad. Really bad. No one will ever see it but you; let it be bad, who cares? The real writing happens bit by bit, draft by draft. Bird by bird. Is this stark voice with zero tolerance for sugar-coating disconcerting or uncomfortable? Not in the least. I’m appreciative, more so each time I revisit her words, to have someone tell it to me straight, as if I’m having coffee with a friend whose advice I trust inherently, even when it hurts. I am grateful for the consistent lack of fluff. The ultimate consequence is that when Lamott hits you with pure inspiration, she hits you hard; on noticing details, for example, she says, “There is ecstasy in paying attention.” And you know what? There really is. I am a lousy blogger. I know this to be true, because in the last two years I’ve tried a couple blogs and I’ve given up on them almost immediately. I never could keep a diary, either, and I have yet to scrapbook my second son’s baby pictures. (He’s four next month.) I think it has something to do with stamping a date on something–a post, a photo, an entry–because then it becomes a marker of time. How much time, how little time, how much time gets away from you between updates. Too much pressure, the passage of all that time. I’d probably do much better with a dateless blog, just a stress-free blank wall of space to make notes or put up quotes or jot a thought or two. I am, however, a writer. And I’d like to reconcile my anti-blogging side with my writer side and see if they can’t get along.